I did an experiment this weekend, one that worked really well. OK, actually I did two, but I’ll save the other one for another post. One of the problems I’ve had with baking bread is religious. My church isn’t allowing me to bake bread. See, with church happening right in the middle of the day, it’s tricky to time the mixing, kneading, rising, shaping, proofing, and, finally, baking and eating in spots where I can still go to church in the middle of it all. It kinda became obvious when I went up to the hospital to visit Jodi and Jake this weekend. I wanted to make bread, and we were going to attend church up at the hospital. There was no way I was going to be able to mix up the bread and let it raise while I made the hour-long trip, attended a short church service, visited with my family, and then made the hour long trek back home. I would have come home to a deflated, over-risen mess. It was one of the few times when my self was actually making sense. So, I decided to listen to him. 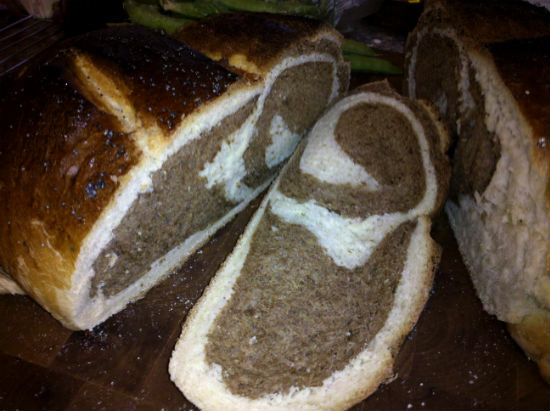 I really wanted to make my old swirled bread again, since it had been so long since I had. I gathered up the ingredients and gave it a try, with my new procedure in mind. Just so you don’t have to look it up again, I’m copying and pasting the ingredients from before, since I didn’t change them. I started with all of the ingredients in the first set. I got the water very hot, then added the honey, and finally the yeast. Adding the honey cools the temperature of the water to a range where the yeast will start, but not get killed. After about ten minutes or so, I added in the flour, then all of the remaining ingredients in that set. I mixed it all up with a trusty wooden spoon, and dumped it onto a floured table top. With a pastry knife, I cut it in half, and set one half aside. In the remaining half, I made a little well and poured in the the molasses, the cocoa, and the Pero. I began kneading it, sprinkling it with flour as I needed, to get it to the smooth, and satiny feel of well kneaded dough. I used fresh King Arthur bread flour, and it came to a windowpane pretty quickly. It also turned a beautiful rich brown from all of the additives. I sprayed my mixing bowl with oil and put the doughball in one side of it, spraying it also with oil. 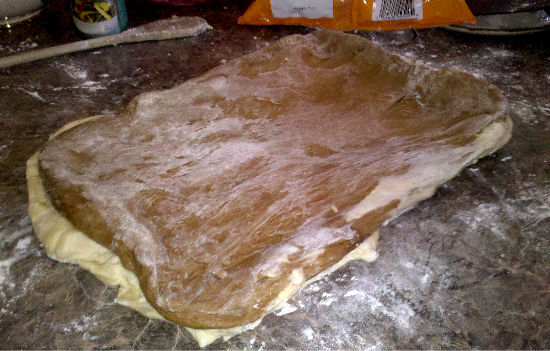 Then, I kneaded up the other half of the dough, without an additional additives. It kneaded faster. I put it in the bowl next to the dark half, also spraying it with oil. I covered the two halves with cellophane and put them in the fridge. Then I went off to church with my family, for some spiritual bread. When I got home, I opened the fridge, not quite sure what I would see. But it was beautiful! 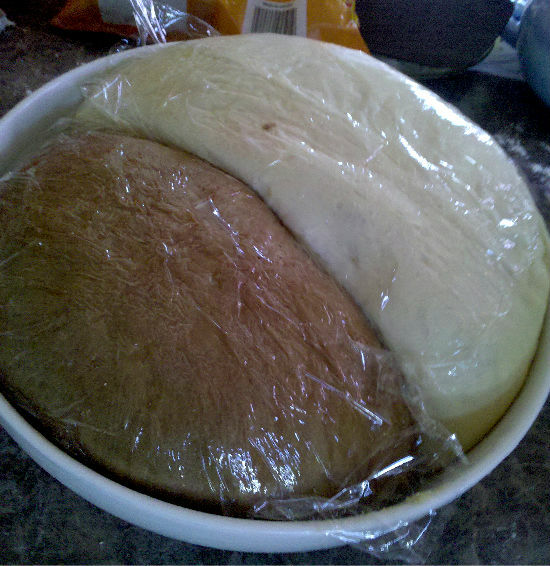 Two well risen dough balls, side by side in the now-full bowl. Just ready to be shaped and baked! Pulling them apart was easy. There was a little that stuck together, but I didn’t figure that was a big deal. I floured up the table and started with the light dough. I spread it out into a rectangle (or close to it) without stretching it too thin. I wanted it fairly even, not like a pizza dough that’s thin in the middle with big lumps on the sides. Then I stretched out the dark half. I layered the two together, with no flour or oil in-between, and rolled it up. 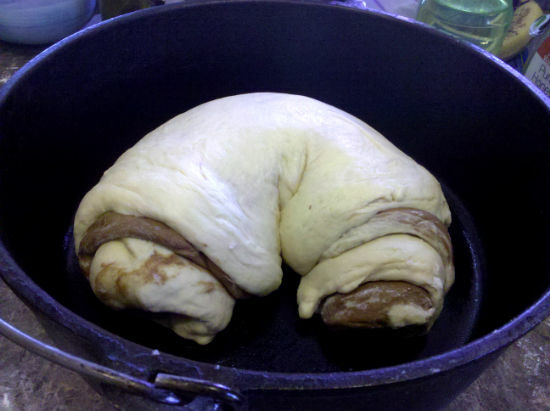 I curled it around and placed it into my oiled dutch oven. I set it aside to proof. As the proofing neared completion, I did a quick egg wash, sliced the top, and sprinkled on some poppy seeds. All along this process, by the way, I had started the coals, and gotten the lid pre-heating like I spell out in this post . I put the bread on the coals and baked it for about an hour, turning every 15-20 minutes. When I hit the right temperature, I pulled it off and let it cool It was sooooo goood! I think the extra raising time even enhanced the flavor. I've been known to sneak out of church and light some charcoal. Kind of a luxury when you live 3 minutes from the chapel.